Written on July 18, 2013 . Posted in Announcements + Updates, Architecture and Design. 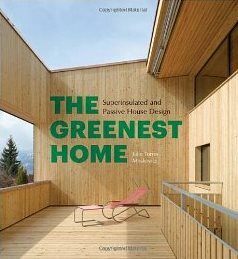 A project by Jonathan Knowles (Associate Professor, Architecture) and Laura Briggs (Critic, Architecture) was just published in “The Greenest Home: Super-insulated and Passive House Design”. Separated by 200 years and 6 feet, the Freeman addition is an exercise in opposites. The addition follows the vernacular tradition but sets up a dialog between past and present, thick and thin, transparent and opaque, and passive and active. The addition is the twin of the original – asymmetrically conjoined with recognizable features but different personalities. The original house has symmetrically arrayed openings for the general illumination of the interior. The apertures in the addition are individually placed to make connections between the existing house, the addition, and the landscape and to provide daylight throughout. The shape of the addition along with the placement of the windows provides a panorama of the surrounding mountains. The view is offered at several moments – the same view appears as a continuation. In addition, where the windows from the original loose heat, the new windows provide surplus energy on an annual basis. The original construction is post and beam, hewn and pegged from large timber. The addition is balloon-framed with truss joists for economy, stiffness and thermal bridge free construction. The 9 ½” depth for the wall studs provides a deep cavity for cellulose insulation. The walls of the original are 5” thick for an R-value of 14. The walls of the addition are 15” thick for an R-value of 50. The addition is 90% more energy-efficient than it’s twin and is pre-certified by the Passive House Institute US*.